While much of the research on emotion regulation has focused on negative emotion regulation and its relationship with psychopathology, there is also increasing evidence that the regulation of positive emotions may be in some instances problematic. This study aimed to investigate the relationship between irrational beliefs, as described in Rational Emotive Behavior Therapy, savoring, depression and joy. Data were collected from a sample of 276 individuals. Participants filled in online the following questionnaires: ABS-2, DASS-21, SBI and DPES. Of the four irrational beliefs (i.e., demandingness, awfulizing, frustration intolerance, and self/other downing), self/other downing explained the highest variance of savoring. Mediation analyses revealed that savoring was a mediator in the relation between self/other downing and depression, as well as in the relation between self/other downing and joy. 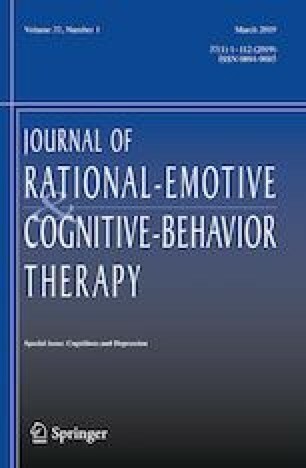 The presence of irrational beliefs is a strong negative predictor of savoring, indicating that positive emotion regulation is influenced by irrational beliefs, particularly by self/other downing. In its turs, savoring has a significant impact on depressive symptoms and positive emotions (i.e., joy). The authors declared no potential conflicts of interest regard this research. All procedures performed in studies involving human participants were in accordance with the ethical standards of Ethics Committee of the Scientific Research Council of Department of Babes-Bolyai University. Informed consent was obtained from each participant.